This simple, hearty salad can be made with ingredients common to the South African pantry, accompanied by an Aioli Dressing. Cook bacon in a frying pan over medium heat until crispy. Place on paper towel to absorb excess fat. Place the sundried tomatoes, olives, chickpeas, mint, coriander, peppers and mozzarella into a bowl. Mix through, then add half the chopped bacon. Add salt and pepper to taste. Allow to infuse for 15 minutes. Place the leaves in a base of service bowl. Arrange the salad ingredients on top of the leaves. 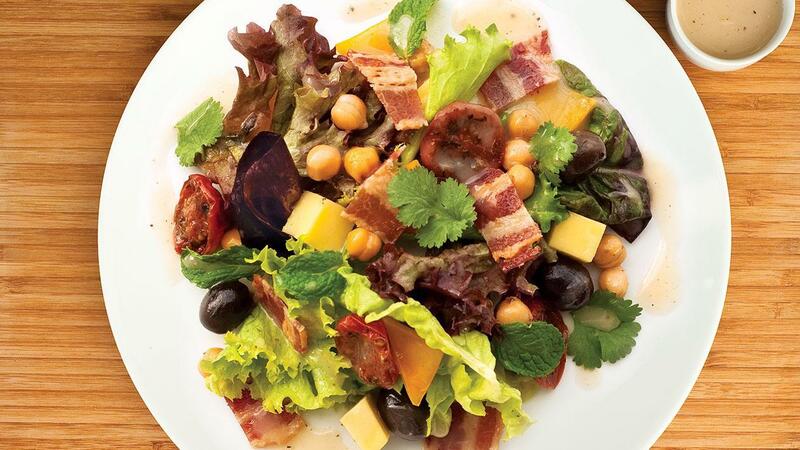 Dress the salad, then add the remaining crunchy bacon bits.